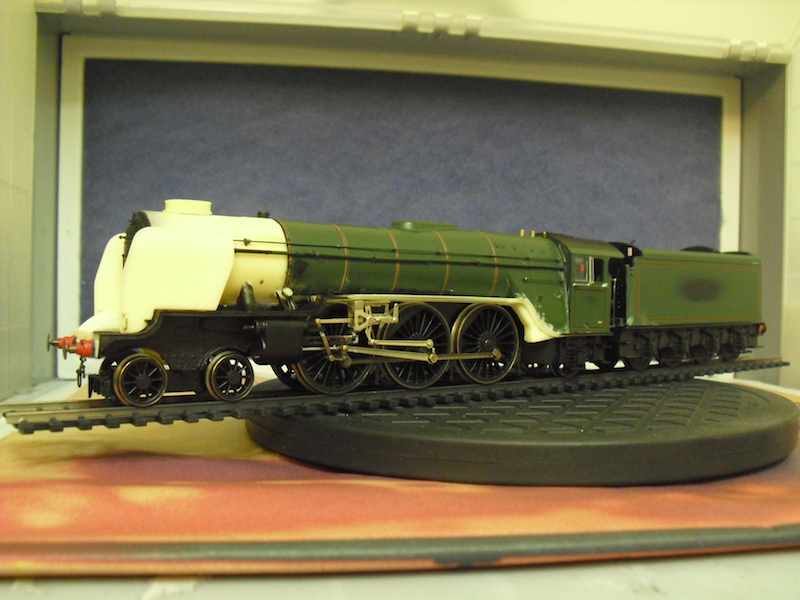 THE BRITISH RAILWAY STORIES LTD: "Great Northern on the final straight..."
I've been working on a model of Thompson's lone A1/1 Pacific, Great Northern, for what seems like forever at times. 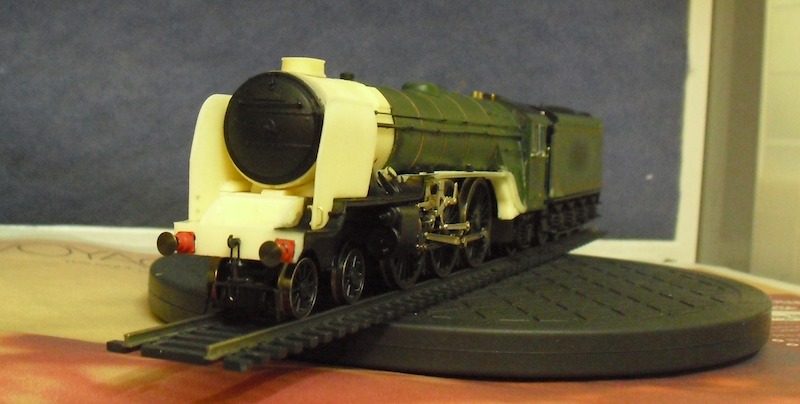 However with the failure of my original build, out of the ashes comes a much more pleasant and more accurate affair, with the help of Graeme King's excellent resin parts, a much valued friend and modeller to work on the valve gear for me, and a little bit of bravery to have a go and chop up a Hornby A3 to build a Thompson 6ft 8in Pacific! 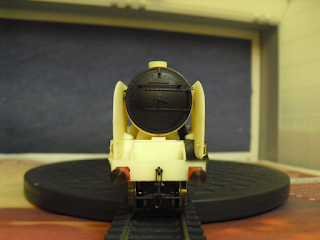 At the front end, I have test fitted the buffers, which are a loose fit with white tack, along with the front coupling. The lifting holes in the frames have also been drilled out, and the smoke deflectors have gained their grab handles on the lower edges. The smokebox has had the holes for the original handrails filled in (these areas will require further touching up, as my dry brushing with black acrylic paint has proven in this photograph). 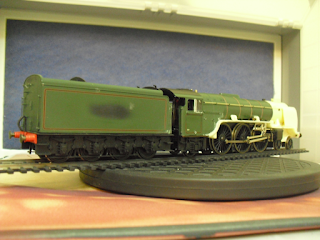 The tender has had its side sheets straightened, but I am yet to add handrails. 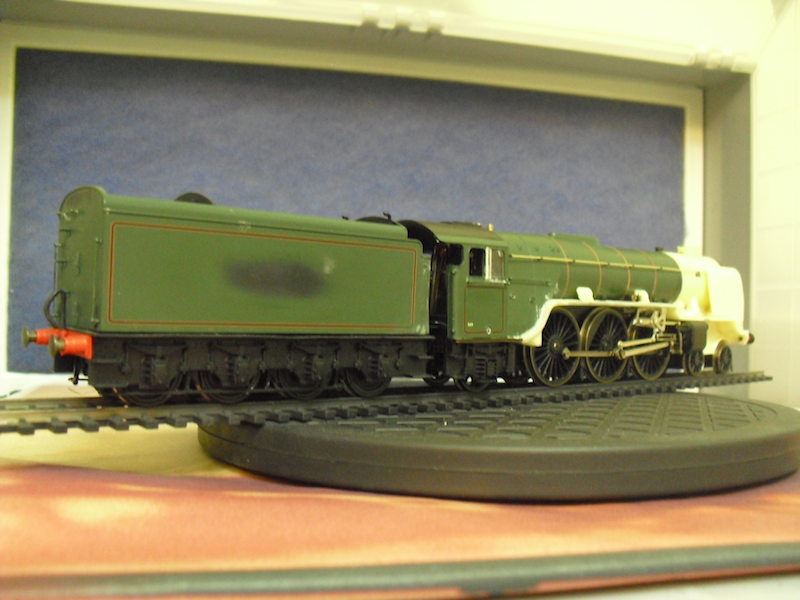 The cab is the next section to tackle on this particular model of 60113, as these need straightening to match the tender. 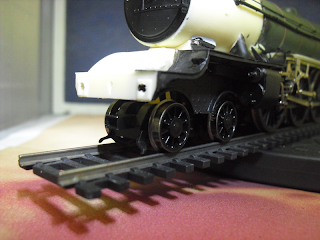 I have also fitted the steam pipe, and handrails on both sides, along with all of the running plate paraphernalia, including the lubricators. You may notice that the bogie has changed from the last update. This is down to an amazing oversight on both mine, and Hornby's part. 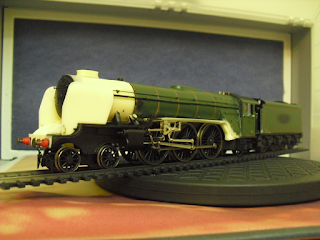 Earlier models of the Gresley A3s and A4s had the pivot on the bogie set at a particular height. The latest models have a longer pivot, which was causing the front end to lift up unnecessarily! I have replaced the later type with the older type, until I figure out how to shorten the pivot. The final change has been to fit the side frames. These are now firmly fitted in place, with some heavy duty plasticard sandwiched between them and the chassis block, glued with cyano. The bogie (originally a Gresley type) has been replaced with a Hornby B1 bogie of the correct type, giving the correct look at the front end, and side frames. The clearance of the bogie is excellent, and I have been very encouraged by the model's test runs on 3rd and 4th radius curves. I still need to fit the cover for the reverser on the left hand side, in addition to the aforementioned cab side sheets, and fitting of handrails there and on the tender. Then, it'll be into primer, and then into blue before lining out...I can hardly wait. Six years after I started the original, I'm finally going to have my express passenger blue Thompson A1/1 I've always wanted. Now where ARE those straight sided nameplates I ordered...!